Would you believe this is Reykjavik? Just outside the city center, between Reykjavik and Kopavogur, there is this little beach, one of the few white sand beaches of all Iceland, that gets really crowdy on a sunny day at these latitudes. Its secret is the fact that it is a geothermal beach, meaning that even if we are in Iceland, you can bath as hot water comes from the underground. You can swim in the ocean. But this is just something for the brave ones as the weather is so cold that you freeze in few seconds. I managed only to put my feet in the water and they were frozen for a long time. Then you can swim in the tiny bay, where in some spots there is hot water coming from the underground. The hot flow comes and goes, but if you like to stay in the salty water you have to hang around those spots. And then, last but not least, and certainly my favourite ones, there are the hot pots where everyone bath. 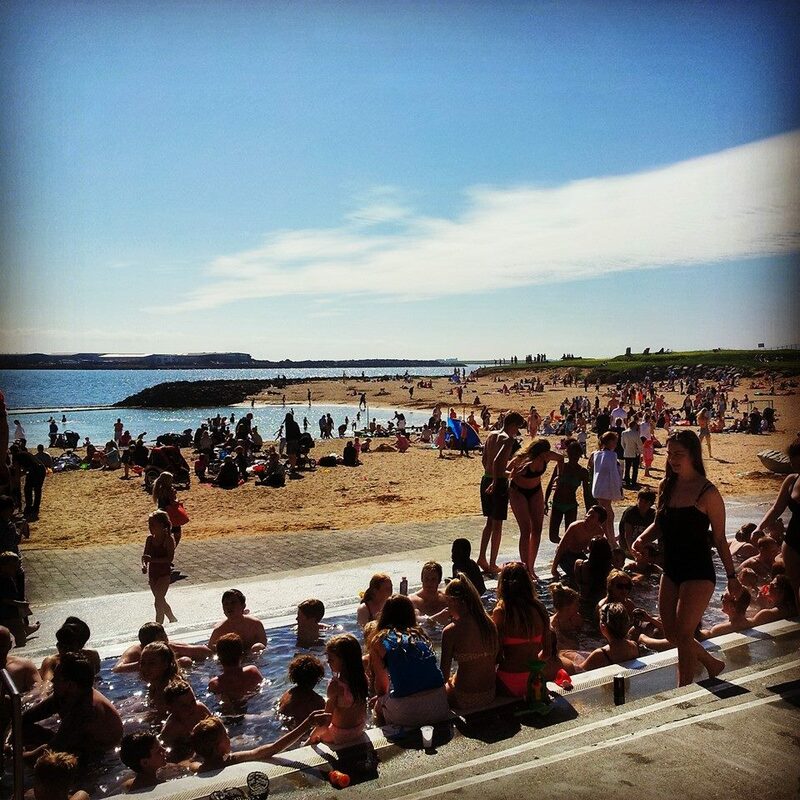 You just sit in the water, together with half nation, and enjoy the 38 degrees of the water and the warmth of the Icelandic sun. Ci credereste mai che questa é Reykjavik, la capitale dell‘Islanda? Subito fuori dal centro cittadino, tra Reykjavik e il sobborgo di Kopavogur, c’ é una piccola spiaggia, una delle poche con sabbia bianca di tutta l‘Islanda, che si riempie di gente in giornate di sole a queste latitudini. Il suo segreto risiede nel fatto che questa é una spiaggia geotermale, dove, l’acqua calda sgorga dal sottosuolo e riscalda l’oceano. Si puó fare un tuffo nell‘oceano vero. Anche se questo é consigliabile solo ai temerari a causa delle temperature proibitive dell‘acqua. Io sono riuscita a mettere i piedi in acqua solo qualche secondo prima di congelarmeli. Poi ci si puó fare il bagno in una piccola baia, dove in mezzo al mare ci sono dei punti in cui sgorga acqua calda dal sottosuolo. La corrente la fa andare e venire, ma éstupendo starci attorno. Ed infine le hot pots, le vasche di acqua calda, le mie preferite. Ce ne sono due sulla spiaggia, Ci si siede comodamente nell‘acqua a 38 gradi e ci si gode il sole con emzza Islanda.